With a smoother, sleeker finish than our standard Certified Organic Cotton Sheets, our Organic Cotton Sateen is every bit as sustainable and healthy as organic cotton, and a whole lot softer. The Organic Cotton Sateen fabric used in this product is GOTS Certified and Imported. Like all of our products, our sheets are made right here in the US, so you can always feel good about knowing you’re buying from us. Very good quality material. 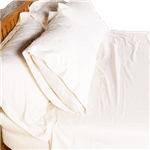 It is nice to have an option for safe, nontoxic bedding. Thank you White Lotus Home! !